After looking at this for months with photographer Eric Meola and the Sony art department, with the blessing of Jon Landau Management, we can finally unveil a stunning piece of art, celebrating this year's 40th anniversary of one of the greatest albums -- and album covers -- of the rock era. The gatefold album cover was originally designed by legendary art director John Berg, who was at Columbia Records from 1961 to 1985. For the new remastered edition, Bett had the challenge of recreating a classic: "When we were reworking the cover art and packaging, there was no exact match for that typeface anymore, which originally had been done in the days of going to a typesetter, pre-Mac. We worked with a typographer to recreate the alphabet from scratch, paying special care to match the letterforms and kerning." There are 1,975 copies for sale through Backstreets, to commemorate the year 1975. 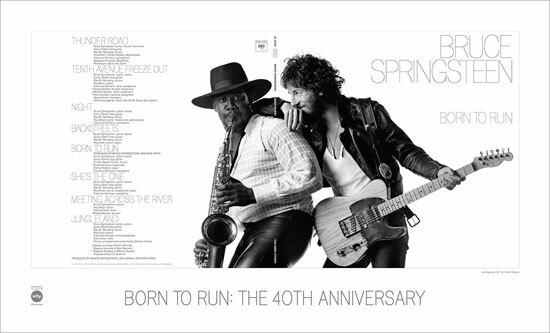 Not only does this 40th anniversary poster give many fans the chance to own an affordable print of this quintessential image, it will also raise considerable funds for WhyHunger, a favorite charitable organization long supported by Springsteen. This year marks the 40th anniversary of not only Born to Run, but also WhyHunger, which began in 1975 as World Hunger Year, founded by the late Harry Chapin and Bill Ayres, who now serves as the organization's Co-Founder & Ambassador. A small logo in the lower left reads, "Celebrating 40 years of WhyHunger." All net proceeds from the sale of this poster will benefit this non-profit 501(c)(3) organization and its work to combat the root causes of hunger, poverty and injustice, supporting grassroots solutions and promoting self-reliance.